Retired Marine General John Kelly has been reportedly asked to lead the Department of Homeland Security. President-elect Donald Trump is set to nominate the former four-star general to head the agency, which oversees border security, US media reported. Mr Kelly, 66, retired in January after leading the military's Southern Command, which is responsible for Latin America and the Caribbean. He would become the third ex-general to join Mr Trump's administration. The Department of Homeland Security is responsible for enforcing US immigration laws, which Mr Trump has vowed to make a priority in his presidency. The department, which was created in the wake of the 9/11 attacks, also oversees a broad range of agencies including the Coast Guard, Secret Service and the Federal Emergency Management Agency (Fema). Mr Kelly, who stepped down after a 45-year military career, is the highest-ranking military officer to lose a child in the wars in Iraq and Afghanistan. His son Robert, a first lieutenant in the Marines, was killed in combat when he stepped on a landmine in Afghanistan in 2010. In 2003, Mr Kelly became the first Marine colonel since 1951 to be promoted to brigadier general while in active combat in Iraq. The seasoned commander has publicly clashed with the Obama administration on several issues, including its attempt to close the detention centre at Guantanamo Bay as well as illegal immigration on the US-Mexico Border - a sentiment he shares with the president-elect. Cracking down on illegal immigration and building a wall along the US-Mexico border were the cornerstone policies of Mr Trump's campaign. The president-elect, who has no military experience, has named Lieutenant General Michael Flynn as his national security adviser and retired General James Mattis as his Defence Secretary. Mr Trump is also considering retired General David Petraeus for the secretary of state post. 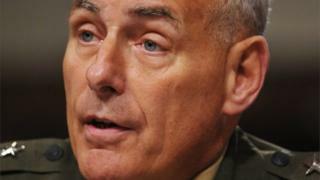 The Republican-controlled Senate must confirm Mr Kelly for the Homeland Security position.